I don't want to jinx myself by putting this in writing but ... I'm now quietly hopeful of growing some chillies this year since this flower appeared on my kitchen windowsill plant yesterday. I'm being tentative in this claim as it's well documented that I'm rubbish at growing plants indoors. Outside, no problem, but inside? Bleh. I wonder why that is? There are many more buds waiting to open and I'm certain that this vigorous little plant has a lot more growing to do. I bought the sturdy but tiny plant in mid-February from Joy Michaud of Sea Spring Seeds. 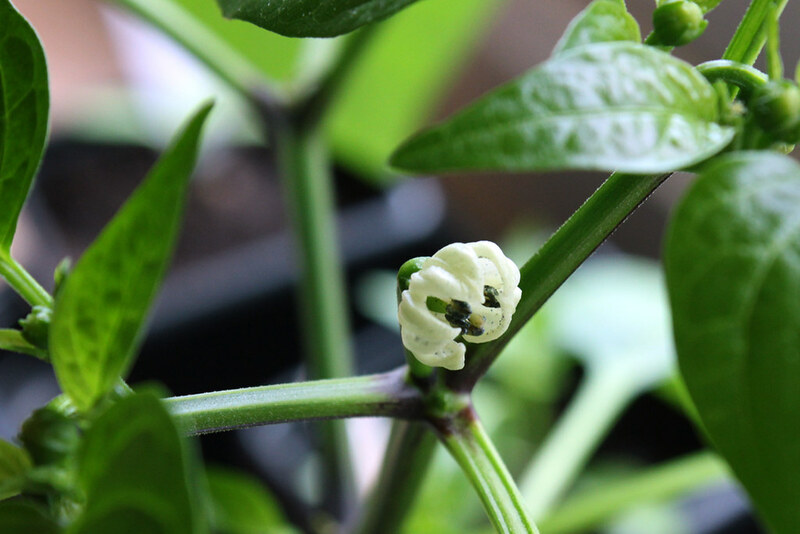 She is an amazing and passionate chilli grower and it's a testament to her skill in giving plants a good start in life that this chilli has continued to thrive in my dubious care. Seedlings should be pricked out into a one litre pot and, when the roots are showing at the base, potted on into a 7.5 litre pot; they'll grow rapidly and can then be repotted into successively larger containers, as needed. A plant will grow to the size of it's pot (depending on the variety of chilli you're growing) but a small pot will restrict its growth. (Video explaining this here.) The giant champion Dorset Naga was in a 160 litre container! Possibly too big for my space - and for my cooking needs - but you take my point. Mix dried chicken manure pellets into the potting compost when transplanting into each successive pot from 7.5 litres upwards; these are slow release and will provide your plant with essential nutrients all season. Water well and fertilise regularly throughout the season (in addition to the chicken manure pellets). When the plants get large, support the branches. Push a couple of canes into the side of the pot and circle the plant with string, securing it to the canes. Add more layers of string as the plant grows. So there we have it. If I follow all this good advice, I might just have to book my slot at the local horticultural show this year! This year I have three rhubarb plants. I don't need three, I needed one (all that my space would allow) and grew Glaskins' Perpetual from a seed several years ago. It's huge and not very pink but I feel very proprietorial as I nurtured it into life all by myself. Even so, when I saw Red Champagne crowns for sale a couple of years ago, of course I thought they sounded better. Red. Champagne. Mm mmm, what's not to love? 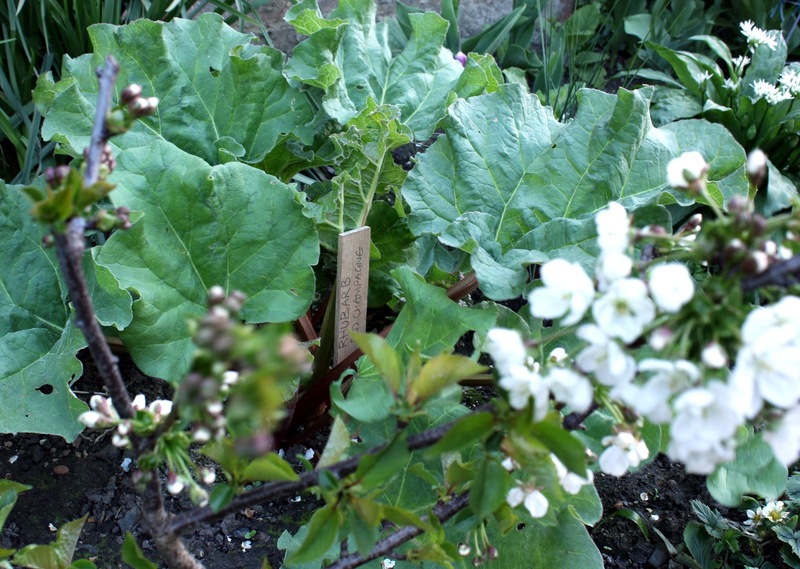 I bought two crowns, planted them under the fruit trees as I'd read that rhubarb could tolerate a bit of shade and where (at the time) there was plenty of bare earth that needed covering and left them to it. I thought I'd lost one plant last year as, without a hose, things get pretty dry under the trees. The other decided to flower you may remember. I wondered whether I'd ever get to taste any red champagne sticks but the crowns were inexpensive so it wouldn't be a huge loss. But reports of the death of my champagne rhubarb crowns were premature. 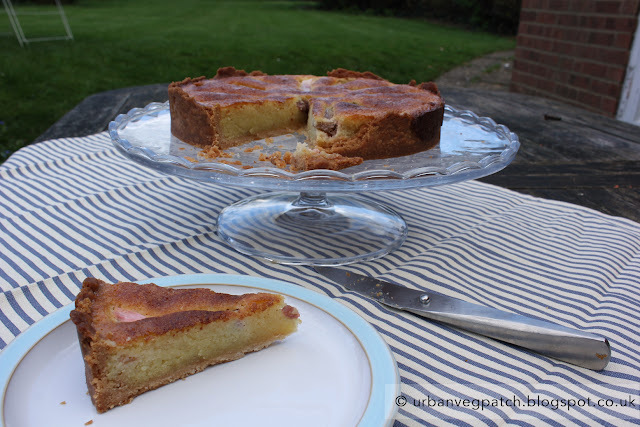 Serendipitously, I opened an email from Simple Things mag last week to find a recipe for Rhubarb and Rosewater Tart. The timing was immaculate as I had the rhubarb in the garden and was in the mood for baking - and had some shop bought cheat's sweet shortcrust pastry in the fridge that needed using. (I'd like to say that I whipped up a batch of home-made pastry but I didn't. There.) It was delicious, whether eaten with cardamon flavoured cream or with friends and family. I made the pie in a smaller tin than suggested to share with family and used the extra filling with a dollop of jam in a small batch of Maids of Honour tarts for my goodie tin at home. Nature is all around us and I can get my daily dose from nearby Hampstead Heath but, try as I might to ignore it, there's also a lot of bricks and mortar around. That's London for you. Some of the architecture around here is brutal - in a modernist way - the local secondary school for example -while elsewhere in the neighbourhood there are parks and turrets, canals, domes and houses with lovely old walls and neatly planted front gardens. 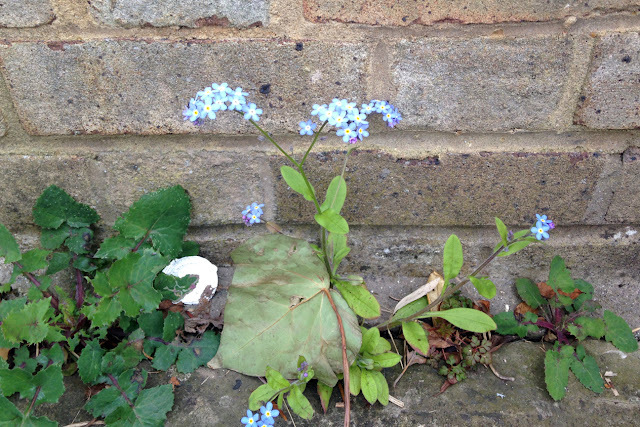 The contrast of old and new, concrete and nature is a daily sight potentially more so here than in the countryside. Even in this all-embracing environment there are sights that just don't fit and one of these is the ability of plants to self seed into the most obscure places. It's awesome. Photographer Paul Debois held a similar fascination for this subject which he captured in his 'Wildlings' exhibition a couple of years ago. The definition of a wildling is a plant that's escaped from cultivation. I like that, the idea of a plant planning on how to tunnel out of a tidy garden or leap over the boundary wall - or just the thought of plants having a secret desire to live life on the other side. Some wildlings are welcome - purple campanula is a regular sight growing out of walls around here, as is Corydalis lutea - and a memory of the lily of the valley and mint that crept into my mother's garden under the next door neighbour's fence has just come to mind. But around here, I'll take what I can get. These for example, spotted on a sunny spring walk - gives a whole new meaning to the phrase 'a weed is only a plant in the wrong place'! 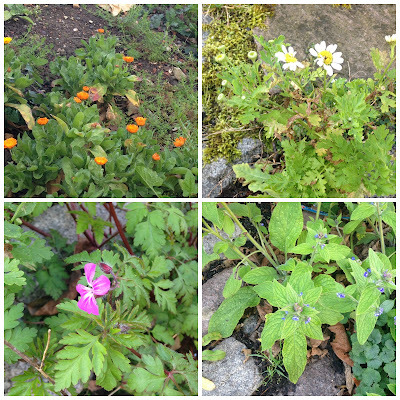 Feverfew, Brunnera, Herb Robert (Geranium robertianum) all growing amongst stone pavers. Apparently fresh leaves of Herb Robert can be used in salads or to make tea and are said to repel mosquitoes if rubbed on the skin. While I often hanker for the country life, living in London does have its occasional perks. 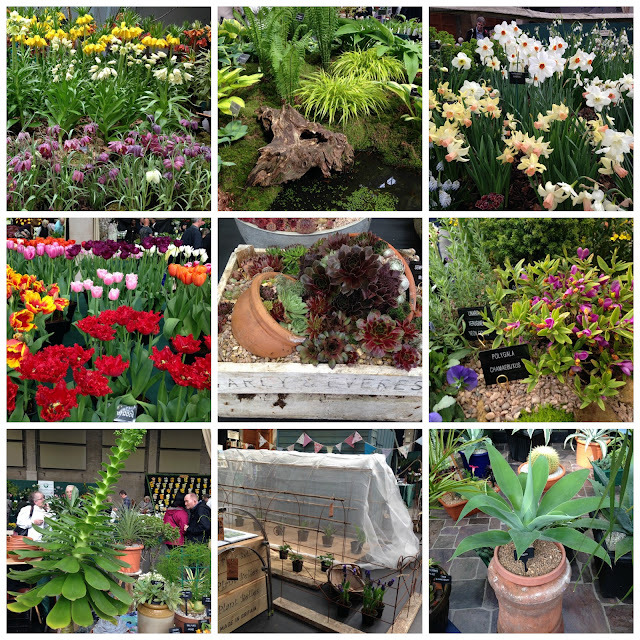 One such is coming up over the next two days with the second of the RHS spring shows - this one is billed as a Spring Plant Extravaganza and includes the RHS Orchid show. 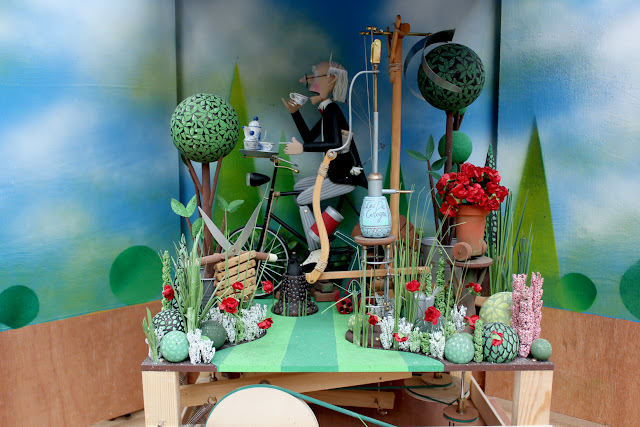 There will be talks throughout both days and there's also a sneak peek at the show garden being built for RHS Tatton Park by the Young Designer of the Year. Wowzer! It's wonderful that the RHS puts on these shows because, no matter what the weather outside, visitors can be cozy and warm indoors, drooling over a selection of the most beautiful plants and getting advice from experienced nurseries and growers. Not to be missed, especially if you have a bit of cash to spend. This is not to say that non-London folk will be overlooked as it's only a couple of weeks before the RHS spring show in Cardiff, followed by Malvern at the beginning of May and Chelsea (whoop whoop) just three weeks after that. * By which time it will be almost summer. So, plenty to entertain us while waiting for our seeds to grow. I can't get to this weekend's show (gardening deadlines to meet) but I did make it to the earlier show in February. I went because I knew that Pennard Plants would, as usual, be there with their enormous A-Z selection of seed potatoes plus I needed some more Polka raspberries from them - and why pay postage? I also wanted to pick up some baby chilli plants from the very reliable Sea Spring Seeds; my home-sown chilli plants matured very late last year, giving me just the one fruit, and then died overwinter. I knew that I could pick up healthy little plants at the show and these are now growing steadily on my kitchen windowsill - sorted! Sea Spring also sell an awesome selection of seeds if you want to grow your own salad leaves, tomatoes and chillies, including the infamous Dorset Naga, one of the hottest chillies available - but I think I'll stick to the salad leaves. Having made my purchases (including some Heritage tomato seeds, again from Pennard, and some more gardening gloves), I was free to wander around the show drinking in the buzz and excitement of gardeners embracing a new gardening year. It's part of the fun, knowing you're among like-minded passionate gardeners and there were plenty of impromptu chats among visitors. There were the usual award winning displays of snowdrops, primulas, hepaticas and iris reticulata (all heart-stoppingly beautiful) but, hey, that was February, we've moved on since then. For a taste of what might be found in today's show, photos in the collage below were taken at last year's spring show. With so many nurseries and trade stands here, there's always the possibility of picking up a really exciting new plant. I bought the glorious Geum 'Totally Tangerine' from Hardy's Garden Plants here a couple of years ago, the same plant that was all over Chelsea flower show that year. Hardy's are fantastic at putting together stunning and inspirational plant combinations in their exhibit - in fact, Rosy Hardy has a show garden at Chelsea this year. How do I know that? The RHS had put on a large display of the drawings and plans for this year's Chelsea gardens in one of the halls and it looks like it's going to be a corker. More about this in a later post. So please go along to the show if you can - I want to read about it! The show is on today and tomorrow (1st + 2nd April, 10-5 pm). Venue is the RHS Halls in Westminster (Victoria or Pimlico tube stations) and there's a café on site. Totally Tangerine - how could I resist? 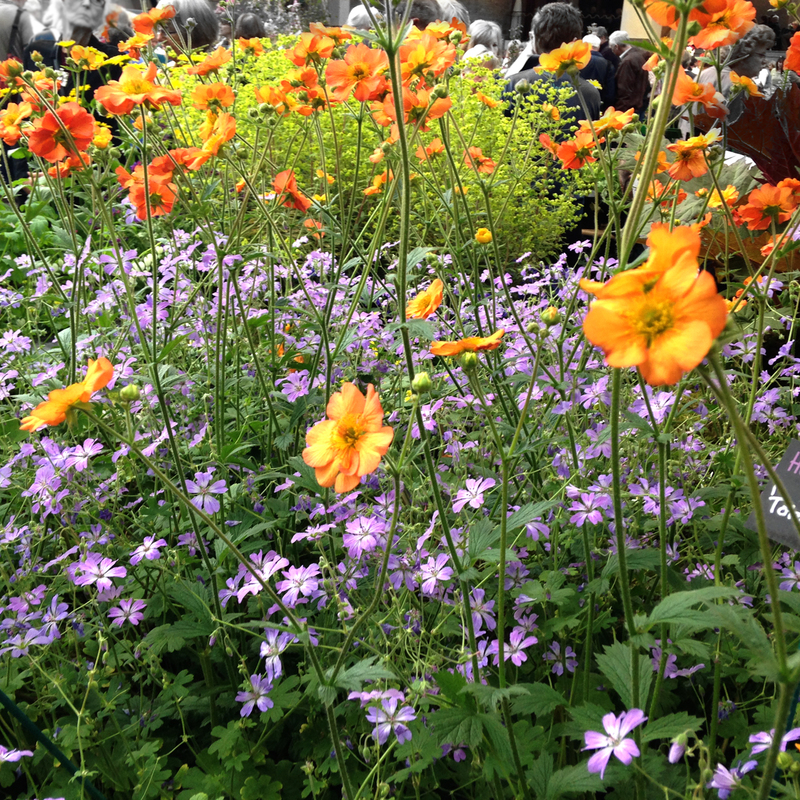 * The Harlow Carr flower show is in June, Tatton Park in July and Hyde Hall is in August. Check out the RHS Events page for more info.